Most evenings, I watch TV with my laptop on my lap (which is why it is so named). TV is better if you don’t pay too much attention. TV is the perfect background. When it’s boring, it relaxes away the stresses from the day. And when it’s interesting (although seldom), it distracts you from the stresses of the day. My husband never cared much for TV. Before I met him, he had mostly garage hobbies. But since vegging out in front of the TV is my favorite past-time, he was sort of sucked into it. Of course, my husband can’t do these three things simultaneously. He can snack and watch TV. Or he can snooze. He multi-tasks by alternating. Before I discovered blogging, I was in charge of the remote. Since my husband was ambivalent at best about TV in general, he didn’t mind. We overwhelmingly watched what I chose. Since I have exquisite taste, it wasn’t a problem. And because I am a wonderful wife, once in a while I would actually tell him when Drag Racing was on. But with my new blogging obsession hobby, I thought it was only fair to turn the remote over to him. It was rather amazing. A man who had no interest in television picks up a remote and the primordial need to channel-surf comes right out of dormancy. Like there must be a channel-surfing gene buried in the y chromosome. This week my husband hit a new high of multi-tasking and channel-surfing. …QVC. Yes, the oohing and aahing over cubic zirconium. I look over at Hubbie in surprise over his selection. 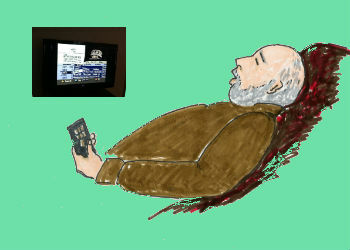 And he’s asleep – with his finger on the remote. My husband can multi-task after all. He can channel-surf WHILE snoozing. With him , I can tell when he’s fallen asleep, because the tv is on the same channel for more than 3 seconds – and it isn’t Greed or racing of some type. And our pie charts would be the same as yours! I love Spider Solitaire! That’s impressive. Taking multitasking to a whole new level. I envy that. I can do just one thing at the same time and when I snooze, I’m useless (well, in the normal sense). I don’t multi-task well at work. I like to do just one thing at a time…and pay attention. My husband’s pie graph: 20% CSI; 40% snooze; 40% cursing some right-wing crazy that’s in the news. 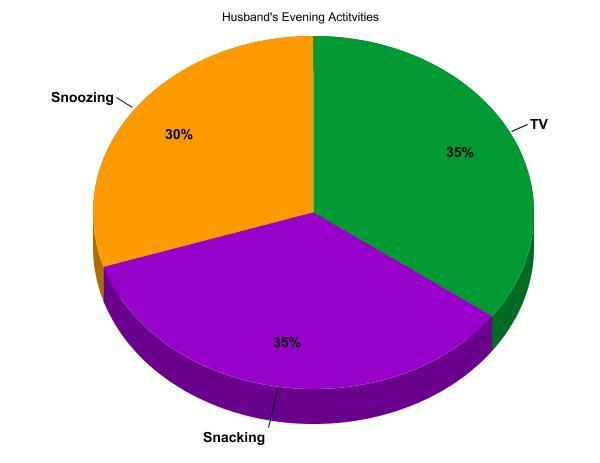 I love graphs and I love how you graphed out yours and your husbands evenings! I instantly wanted to graph my life. Color code it how fun! I probably won’t but I really appreciate that you did. I’m a multi tasker as well I can do several things with back ground TV noise. Although when I listen to say a radio talk show I’m single minded and can’t seem to multi task. I’m not sure maybe because my primary learning style I think is auditory not sure. Anyway Loved this Post. What, no sports? I’d have to add sports and cursing in equal measures to my husband’s pie chart. Only Drag Racing. And even then, half the time he is snoring. 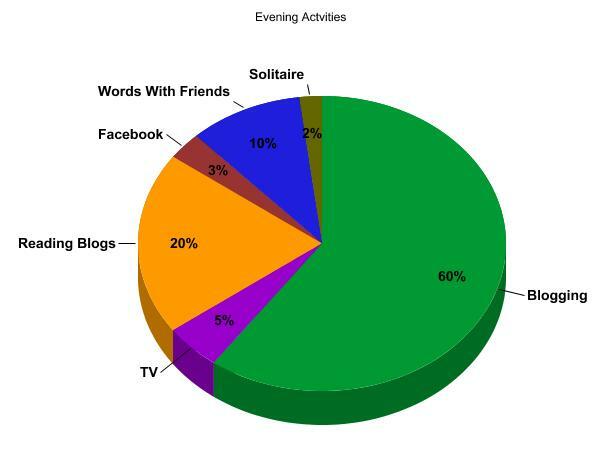 My husbands pie chart 50% Golf channel, 20% Love & Marriage (while Sleeping), 30% War Games! As always love the art and the humor, thanks! Got a real chuckle out of your post today! I never understood how men can sit down in their ‘comfy’ chairs and fall asleep within two or three seconds, all the while maintaining a firm grip on the television remote. I do think it has to be genetic…I wonder if cavemen fell asleep holding onto their clubs the same way? Great charts, too. love that idea! Wow! I am in awe of your husband’s sleep/remoting talent! That’s got to be a new one. I’m glad you are good at multitasking because you can watch TV while you fulfill the lengthiest blog assignment ever assigned in the history of blog assignment. I’ve tagged you in this game of tag and it will be fun? Yes, fun! Thanks…I’ll check it out. I think it might get harder as this game progresses, since we have a lot of the same blogging friends. It’s like you were sitting in my living room with me! And I’m delighted to have you, but next time call first, ok? Just popped round to mention your entry in The Jacket: A Writing Competition has just been posted. Check it out – it looks great! Thanks for contributing. You are nicer than me. It drives me crazy when we go from channel to channel. How long could you go without either one (TV OR INTERNET)? For instance, we often go on vacation for several weeks at time and do not email, watch television or any of the other stuff. Absolutely brilliant blog! Love the pie charts – Imine would be almost identical to yours except for the solitaire – that part would be looking at houses for sale – not that we want to move – I just love being nosey looking round other houses! I am more than delighted to have nominated your blog for the Sunshine Award! Your posts brighten my day everytime I read one … thank you so very much! It’s definitely a permutation of the y chromosome. I look forward everyday to reading your posts!!!! I LOVE charts. I’ve heard a picture is worth a thousand words and charts tell it all. Nice job.